For most of Todd Rundgren’s two-hour set Friday night at the Voodoo, the cult classic rocker ignored his guitar and his impressive back catalog. Instead, he concentrated on his 25th solo album, “Global,” and performed against a backdrop of throbbing synthesizers and programmed drums. It could easily have been a mess. It was enthralling. 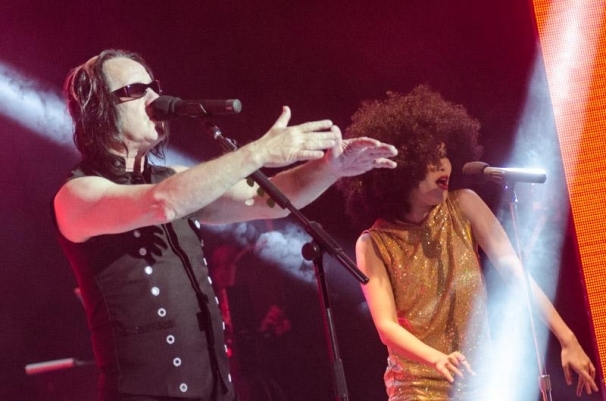 Keyboard player/laptop master Dam-Funk and two female backing vocalists provided all the support Rundgren needed. Several times they left him alone onstage to sing over prerecorded tracks. The music was perfect for a big dance floor. Sadly, the floor at Voodoo was ruined by neat rows of chairs. “Global” is less than two weeks old, so the material was too new for any singalongs, but Rundgren had no trouble convincing the near-capacity crowd to clap along. An environmental theme was evident in the song titles — “Terra Firma,” “This Island Earth” — but the energetic dance arrangements kept the lyrics from getting too heavy-handed. Only while chastising climate change deniers in “Blind” did Rundgren get preachy. Rare trips into the back catalog for “One World” and “Worldwide Epiphany” also continued this theme. “Soothe” was the best new song of the night. When Rundgren inevitably chases his muse around the next corner, it’s not hard to imagine this ballad remaining in the set list. It also worked as the perfect bridge to three of Rundgren’s biggest hits. “Holyland,” another new song, sounded like a lost Peter Gabriel collaboration. Two songs, both from 2013’s “State” album, hinted at an alternate career path for Rundgren. Performed alone onstage, the heartfelt “Ping Me” would be a hit in the hands of a young pop star. Uber-fun “Party Liquor” more than lived up to its title and made me wonder what would happen if Rundgren got booked into an electronic dance music festival under an alias. Last fall, Rundgren played Starlight as part of Ringo’s All-Starr Band. Readings of “I Saw the Light” that night and on Friday couldn’t have been more different. Although the melody was close enough that fans could still sing — and whistle — along, “Light,” “Hello It’s Me” and “Can We Still Be Friends” all got an electronic dance music facelift. The guitar finally came back out for main set closer “Worldwide Epiphany” and encore “International Feel.” Although it still had a strong dance tempo, Rundgren unleashed a blistering solo during “Feel,” finally giving the fans a bit of what they may have been expecting. The moment probably wasn’t enough to persuade the purist, but fans willing to follow Rundgren down the rabbit hole were rewarded. Setlist: I Wanna Thank You (For Steppin’ Into My Life) (performed by Dam-Funk); Evrybody; Flesh & Blood; Rise; Truth; Secret Society; Ping Me, Earth Mother; Skyscraper; Party Liquor; Blind; Smoke; Holyland; Terra Firma; Today; This Island Earth; One World; Future; Global Nation; Soothe; Can We Still Be Friends/I Saw the Light/Hello It’s Me; Worldwide Epiphany. Encore: International Feel > Just One Victory.